Thanks for availing these documents online. We people of the two countries are the last to know what is going on. Thanks for sharing this article. It means you have a good attitude and working positively for world peace and many other hot places around the globe that need peace and International Resolutions needed for worlds’ pressing issues. Keep the good job and make the world a better place to live. Thanks Mr. Lumayat for having sent me information about the last round-talk between Sudan and S.Sudan Presidents that ended last Wedensday/Thursday in Adis Ababa-Ethiopia.I think what the two leaders agreed on were understood by most S.Sudanese people if not all. But up now what I don’t udertand is the issue of Abiye and Mile 14. The Messirias are N.Kordofan residents,and they come to Abiye seasonal only for few months to graze thier cattle.Let people reason on geographic prospect,the Messirias travel from north all the way through S.Kordofan to Abiye area that does not share common frontier with them.This shows that the Messirias have no rightto claim residency of Abiye that belong to our people the Dinka Ngok.This fact is known to evrey single S.Sudanese and to even they the arabs in the north “specially Bashir gevernment” but they only pretend and want to sit on truth.We still have time ahead and I hope our leaders will come forward with all facts to claim our mother land S.Sudan the next round if at all plan. I think this move will lessen wars in both Sudans. There is nothing more rewarding than focusing on economic improvement. It creates more developments and aimless war creates more wars. Both Sudans need to focus on economic development and allow flow of businesses between these countries. I appreciate the man who came up with this idea. How long should Sudans stay in wars? It should be good for both to strengthen economic and security. If these two areas are strengthened, citizens will be secured and they will be thinking for developmental things. This id half baked agreement .This Naivasha 2 .The Islamists as usual play the cliff -edge strategy ,Ever time you try hard the will give in .What about Blue Nile ,Darfur and South Kordofan ,with no hope in sight .Why do the civilized world help an oppressive and corrupt regime in Khartoum? It is good to have reached to those agreement.The most challenging part will be the implementation,I hope both sides will abide by them.Then they will have to finish with Abiye and the border demacation. The AGREEMENT between South Sudan and Sudan has come in the right time as the two countries have learnt from the sufferings of their citizens because of unwise hurried actions that brought the Sudans to WAR early this year. It’s hoped that this time the two leaders would not foreget the lessons learnt and will commit to the timely implementation of what they agreed and sealed willingly. LONG LIVE THE AGREEMENT and the two countries should show sincerity in reaching an Agreement on remaining outstanding ISSUES. not interested in this peace, better war with sudan because refusing in our places & panthou means war, we don,t have borders with Arabs but we have borders with Fur, Nubains, & Fonji people, hence we know our borders with Africans not Arabs, so better war than peace, this is my I idea. Thanks for getting these documents up. It really helps to see exactly what the parties agreed to. Thanks for the signing of the agreements,but let us be carefully with people that can easilly get rid for exploitation of the oil. 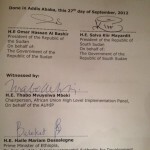 Thanks for having the full documents of the cooperation agreement between Sudan and South Sudan posted on your website. It is a terrific achievement in guaranteeing the constitutional right of access to information. I never thought I would be able to find all of them because the government does not guarantee access to information as a constitutional right. Yesterday was a rough day because I never realised I would find them but thank God you provided them for me or us in unison as South Sudanese. I personally congratulated the two presidents of Sudan and South Sudan for reching a sustainable comprehensive consensus outstanding issues in the CPA and post referedum items amicably. And advice president Omer Hassan Al Bashir to avoid ill intention game against the south sudanese people by imposing unjustified threat of war and impression s well. South Sudan of today is south sudan of yester years whereby Islamists brotherhood played divided and rule policies against the south sudan which led the two sudans into decade of war since 1955-2005. should the third war broke out among the two countries again Bashir will face severe challenges of economic inflationary. However,I advice also our brothers of Northern Bahr el Ghazal state not to mount heavy pressure against our president General salva kiir and south sudan lead negiator comrade pagan Amum Okiech on the decision they had reached on mile 14. president kiir did not sold any portion of Aweil land if analysis are to be carried out. Most are British colonial records that date back to the h century when South Sudan was still part of Sudan .